Bollards are made of 1/8" tubular steel with 2 coats of industrial grade exterior powder coated finish and a polycarbonate cap and recessed switch cutout. 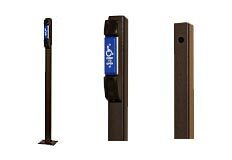 Bollards are either 42" for surface mounting or 58" for in-ground installation (bollard + ground post.) See data sheet below. 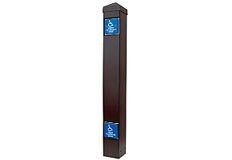 Narrow bollards are made of 1/8" tubular steel with LongLife™ finish and a welded top piece. The 59J switch is surface mounted to the post in a beveled 1010 box. 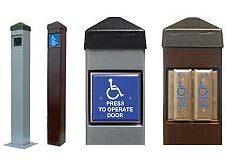 The 514 bollard is 42" in length and is intended for surface mounting. See data sheet below.